Magnus Ridge Winery, was established in 2007, the year of our first harvest. We grow primarily our own grapes on 73 acres of land in the Finger Lakes, carefully balancing vineyards, woodlands and ponds. Matt is our winemaker. He brings over 20 years of experience and a passion to produce the finest wines in the region. 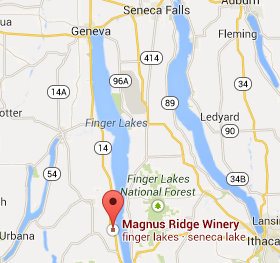 Magnus Ridge Winery is situated on a beautiful park-like setting on the west side of Seneca Lake in Rock Stream. Visitors can leisurely enjoy our facilities, which include four tasting rooms, the Waterlilies Café and a fabulous gift shop. For us, Magnus Ridge Winery is the culmination of a lifetime dream. We are proud and overjoyed to share it with you, and we are always thinking of new ways to make everyone’s visit here more enjoyable, relaxing and fun. Our goal is that every visitor, from individuals to large groups, have a wine tasting experience they will never forget. Enjoy your visit to Magnus Ridge Winery! It’s not just every day you find a place on the map you visit and experience pure pleasantries. But here at Magnus Ridge Winery we did exactly that. I just want to thank Sandy and Matt for the awesome job you are doing. I want to share how nice a time we had on our visit to Magnus Ridge, this past weekend. The wine tasting was great, paired with the variety of cheeses. Each wine and cheese I sampled was clearly marked with quality and were well thought out matches and the service was friendly, thank you Scott. The décor inside was warm & welcoming, with so much to see, and lots to choose from (with great gifts for Christmas), the view out the back displayed beautiful grounds that would make a perfect setting for a small reception, and there were many yummy treats to choose from as well in the café. To complete our visit I topped it off with a wine slushy which is an absolute must. Very refreshing. I look forward to making a batch of them for the 4th of July holiday. I only hope I can make them just as yummy, with the Fire Ant Red Wine. I would love the recipe. Our family visited the Watkins Glen area, as a way to gather & explore the area, coming from different parts of New York State. My family members came from the Albany/Delmar NY area, and my husband and I traveled from Fairport NY. We look forward to traveling back to the Seneca Lake area again in the future, and Magnus Ridge will definitely be on our itinerary. It would be great to see your wines featured here on the shelves of our local liquor store in Fairport NY. Please call to schedule an event with Waterlilies Cafe. Magnus Ridge Winery © 2014. All Rights Reserved.